Guests with advanced osteoarthritis of the hip may be candidates for hip resurfacing or hip replacement if all non-surgical options have failed. Surgery should be discussed with the DOC orthopedic surgeon if the hip causes severe pain, negatively affects quality of life and interferes with normal activities. The hip is a ball-and-socket joint. The rounded end of the thighbone (femur) fits into a cup-shaped socket (acetabulum) in the pelvis. The acetabulum is ringed by strong fibrocartilage that creates a tight seal and helps to provide stability to the joint. When the cartilage begins wearing away, the bones can rub directly against each other, causing decreased mobility and chronic pain. In a total hip replacement, the head of the thighbone (femoral head) and the damaged or diseased socket (acetabulum) are both removed and replaced with metal, plastic, or ceramic components. In hip resurfacing, the femoral head is not removed, but is trimmed and capped with a smooth metal covering. The size of the ball is larger than in a hip replacement and closer to the size of the natural ball of the hip. The damaged bone and cartilage within the socket is removed and replaced with a metal shell. Because the implants are mechanical parts, they may wear out or loosen over time, 10 and 20 years after the procedure. Hip resurfacing removes less bone from the femur than a hip replacement. 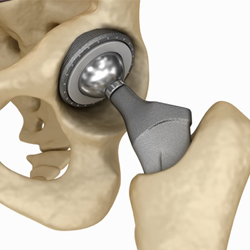 So some surgeons believe it is easier to replace implants after hip resurfacing. A comprehensive evaluation by the DOC orthopedic surgeon will help to determine if a guest is a good candidate for hip resurfacing or replacement. X-rays, CT, MRI, and ultrasound imaging enable the surgeon to see how much joint cartilage is lost and therefore determine the optimal hip surgery option for each guest. The surgery generally requires one to two days in the hospital. Following surgery, the physical therapist will guide the guest through exercises to help restore and maintain range of motion and strength and reduce joint pain and stiffness. The guest will continue to see the orthopedic surgeon for follow-up visits at regular intervals. Activities of daily living can usually be resumed six weeks after surgery.